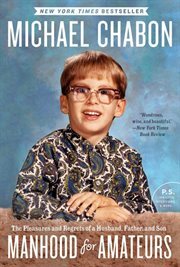 The item Manhood for amateurs : the pleasures and regrets of a husband, father, and son, Michael Chabon, (ebook) represents a specific, individual, material embodiment of a distinct intellectual or artistic creation found in Charlotte Mecklenburg Library. A Best Book Of The Year Time - St. Louis Post-Dispatch - Kansas City Star San Francisco Chronicle - NPR - Seattle TimesA shy manifesto, an impractical handbook, the true story of a fabulist, an entire life in parts and pieces, Manhood for Amateurs is the first sustained work of personal writing from Pulitzer Prize-winning author Michael Chabon. In these insightful, provocative, slyly interlinked essays, one of our most brilliant and humane writers addresses with his characteristic warmth and lyric wit the all-important question: What does it mean to be a man today?